What I love best about sit and stand strollers is how it makes your older child feel like a big kid. They have the choice to get out and walk, and when they’re ready, they’ll come back to the stroller to either stand on the bench or take a rest on the padded bench. It’s empowering to them to have those choices! 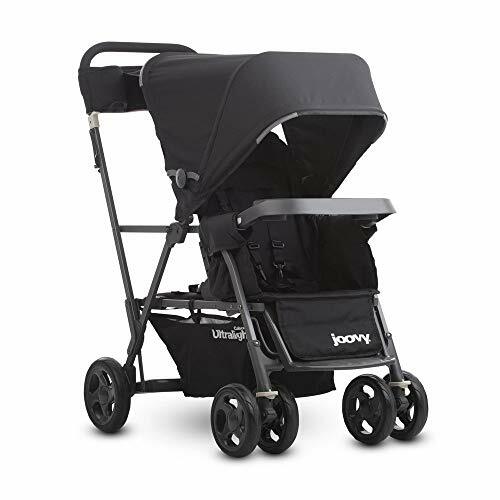 And when they are ready for the stroller, the Joovy Caboose Ultralight Graphite is comfortable and safe and easy to use. For years, Joovy had what I thought was the best stand-on stroller: the Caboose Ultralight. Being constant innovators, though, Joovy found more ways to improve upon the design and now this sit and stand stroller is called the Joovy Caboose Ultralight Graphite. Excited to experience what Joovy improved, I jumped on the chance when I was offered a product review of the Caboose Ultralight Graphite. Right now the Joovy Caboose Ultralight Graphite has garnered very high praise. I personally tested this stroller and can honestly say that I agree. Full disclosure: this stroller was provided to review by Joovy, but it in no way influenced my unbiased analysis. Read on! 3 All about the seat. 8 And the sun canopy? 9 What do others think? 11 Where can I get the best price? As the name suggests, the Caboose Ultralight Graphite weighs 4 pounds less than the basic Caboose Graphite model. 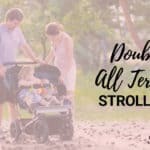 At 23.5 pounds (with the child’s snack tray attached), it weighs far less than most double strollers and is about the same weight as a double umbrella stroller. When I push the Ultralight Graphite, it maneuvers just like a single stroller, perhaps just a tad bit longer, as to be expected. Since this product is incredibly lightweight, pushing two kids at the same time is effortless and rides are always smooth with the 4-wheel suspension system. I took this stroller over bumpy, cracked sidewalks and park terrain. Popping over curbs was relatively easy when I leveraged my foot down on the standing platform. I tested it with 30 pounds in the front seat and with that weight, it went over pretty smoothly! Ball bearings in the wheels make maneuvering relatively easy. I can steer on a straightaway one-handed, but with more than 30 pounds, I’d definitely have to use two hands, especially to turn corners. The wheels are made of softer rubber and when I got back from my route, I noticed some big thorns sticking out of the wheels. I was surprised that wheels held up fine – puncture holes didn’t flatten them at all. Can’t say that about air-filled tires! One step linked brakes are quick and easy to use. While not flip-flop friendly, they perform their function well, which is the bottom line, right? 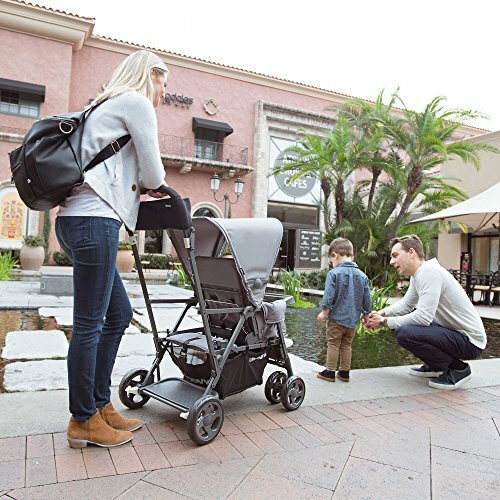 After testing out the Joovy Caboose Ultralight Graphite, I feel that it is a wonderful choice of tandem stroller for long distance strolls such as shopping day or taking a special day at a theme park like Disneyland. The padded seat and bench each can take a child up to 45 pounds for a total of a 90-pound weight capacity. This requires a sturdy build and this stroller, while having a light weight minimal frame, is by no means rickety. The seat has a three-position recline done by pulling up on a metal horizontal rod behind the seat. The seatback measures 16½ inches, which is not that tall, but since the top of the seat is not enclosed, a taller child will still be comfortable in full recline. An adjustable 5-point safety harness keeps your child snugly in place. The buckle is pretty easy to do, press the button and it pops out into two pieces. It is not a puzzle buckle. The shoulder straps are not padded. The two position footrest props your little one’s legs up for a nice nap. This photo shows the seat in full recline with the legrest propped up. Comfy! The bench slides a few inches forward or backward, enabling your older child to sit when the front seat is reclined. The front seat can only go into the 2nd recline position and still have enough room for your older child to access the bench. So if you’re using a car seat, your older one will have to stand. The bench has a 3-point safety belt, and the buckle is the same as the seat harness. Each Ultralight Caboose comes with a Universal Car Seat Adapter that snaps right onto the end of the arm rests. And when Joovy says “universal” they mean it; just about any car seat fits and you can see an entire chart here. The safety strap that secures your car seat in place stays in neat little pockets on either side of the seat. The stroller can be folded without taking the seat adapter off, but it will be longer, so keep this in mind when considering storage or taking it in your car. When your baby is old enough to transition to the toddler seat, just take out the car seat adapter and replace it with the snack tray. Joovy’s snack tray has two cup holders and a depression in the middle for snacks or little toys. Open length: 38″Handle height: 42″Seat width: 11″Seatback: 16½”Seatback to canopy: 25½”Seat depth: 9″Wheel size: 7″ Front; 8″ RearFront Seat: Age: 6 months+max. weight: 45 lbs., max. height: 40″Rear Seat & Platform: Age: 2½years+,max weight: 45 lbs., max. height: 44″Stroller weight: 23 lbs. So the fold is quite simple, but there are a few steps to take before doing so. The seat has to be fully upright, the rear wheels locked and the front wheels also locked straight. Unhook the small side frame lock that keeps the stroller expanded. Then you pull up on the two folding mechanisms just below each side of the handlebar and push forward. From there it folds up quite easily and a frame lock holds everything in place. It does fold onto the ground, and I wish it were more of a standing fold because the bottom of the storage basket could get dirty or wet, depending on where you have to fold it. The Joovy Caboose Ultralight folds up as compact as a single stroller and reviews claim that it can be stored easily in smaller car trunks like the Toyota Prius. While the depth of the fold is less than 10 inches, it is quite long: 45¼ inches. Folded with the seat adapter connected, then you need to add an additional 4½ inches, so you’re looking at a folded length of 49½ inches. Keep this in mind when considering your trunk space. Unfolding is super easy. Unhook the frame lock and it unfolds itself in one motion. I was really disappointed with the design of this stroller with regard to the storage basket. While the storage basket is roomy, accessing it is a different story. The bench over the basket does slide forward and backward, but not enough to give you much room to put in a big diaper bag or anything else bulky. Look at the photo above. The space allowed was only a finger-to-thumb-width from the bench seat. What about side access? Nope. Side access is hindered by straps in the middle that hold the basket up on the sides, so as long as your items are really small, it’s either not possible or difficult. The previous version of this Caboose Ultralight had additional side pockets on the basket, that the Graphite version lacks. Why did you get rid of the side pockets, Joovy? 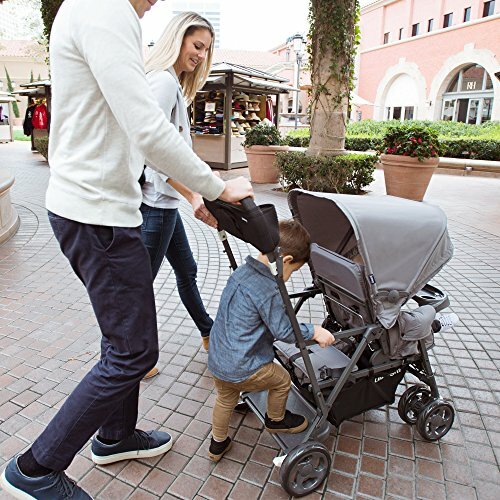 This stroller comes with a machine washable neoprene parent organizer that slips over the handlebar, which many moms and dads enjoy and praise. A rear zippered pocket is handy for storing and easy access of your keys, camera, cell phone, and more. Dual cup holders carry your drinks and the neoprene material keeps your beverage at just the right temperature. It is deep enough to hold my big water bottle. One of the features I truly love is the sun canopy. Many sit and stand strollers only have a canopy for the child in the front. The older child, when sitting on the bench, has no canopy to protect from the sun. But Joovy was the first to design a canopy that shades both of your kids with a large boxy shape. And they went further with the Joovy Caboose Ultralight Graphite. In this version, they’ve added a shade extension that folds up in the parent console between the cup holders. When you’re ready to use it, pull out the fabric and zip it to the canopy for additional coverage. Really an excellent idea for those sunny days, and you can feel better knowing your older child now has better protection. Oh, and an added bonus are the reflective accents on the canopy corners that stand out in low light conditions as a bonus safety precaution. 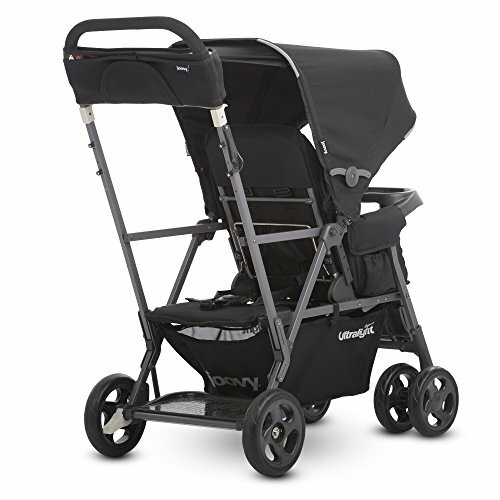 Parents like the Joovy Caboose Ultralight Graphite for overall convenience, light weight and compact size. Customers take this stroller grocery shopping and other errands, and it is a winner for family vacations and theme parks. I personally found that this product maneuvered quite well and went over bumpy sidewalks with ease. Children find the seat and bench nice and comfortable and the snack tray does not come up too high. I heartily recommend the Joovy Caboose Ultralight Graphite. I personally found that this product maneuvered quite well with kids and went over bumpy sidewalks with ease. Children find the seat and bench nice and comfortable and the snack tray does not come up too high with a 13-month-old in the seat. I am very, very pleased with the Ultralight. I only found a couple of disadvantages when testing out this stroller and the biggest was having access to the underseat basket. It’s simply not that easy to get to. If you add the Joovy Too 2nd seat, the child’s feet go into the basket (as is common with most strollers that add a 2nd seat). But even if you don’t add the second seat, the bench does not slide forward or backward far enough for access. If the seat is reclined, it’s impossible to get in there. Also if the seat is reclined completely, your older child won’t be able to sit on the bench. Keep this in mind if you’re planning to use this stroller as a travel system. 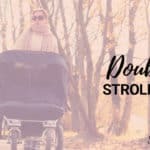 Neither of these issues are deal breakers, and together they knock only one star off a well-made, lightweight stroller for two. I still highly recommend this sit and stand stroller! As with all the strollers reviewed on Stroller Envy, I like to keep a check on the prices and I generally find that Amazon consistently has the best price. Just imagine how great you’ll feel in a few days when you put together your new Joovy Caboose Ultralight Graphite and take your kids for a spin around the neighborhood.